Founded by aviation industry professionals with decades of experience, AEPC™ offers the only Piston Engine Service Programs for the general aviation industry. By utilizing data from large fleet operations and more than 4,000 piston aircraft engine overhauls, AEPC™ delivers a full range of scheduled and unscheduled piston engine programs and services. 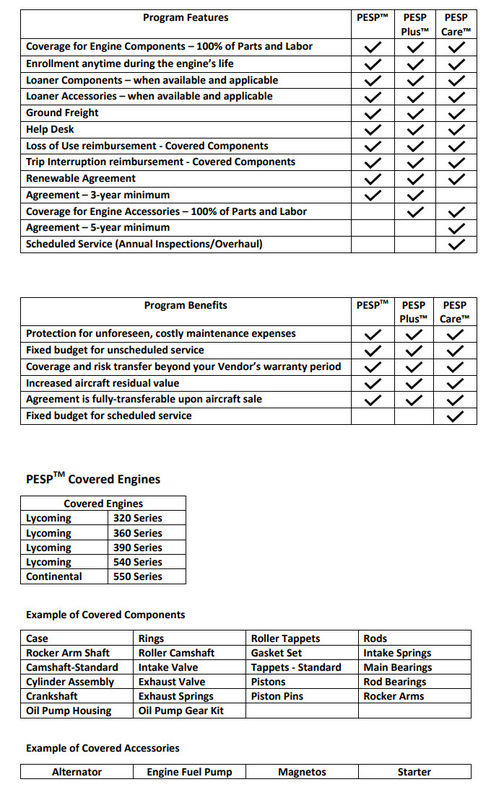 AEPC™ offers the only Piston Engine Service Program (PESP™) to minimize the risk of costly unscheduled service, stabilize your scheduled service budget and keep your engine running and your plane flying. With access to technical aviation advisers, resolving unscheduled maintenance repair issues is quick and easy. AEPCTM advisers work directly with you to troubleshoot any problem and coordinate with an acceptable FAA-Approved repair facility to perform any necessary service. Delivering predictability, protection, peace of mind and financial stability, AEPC™ programs are transferable upon the sale or trade of the covered aircraft resulting in increased aircraft residual value. AEPC™ has several service programs to fit your individual aircraft needs.